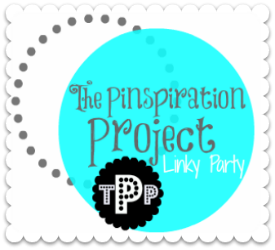 It's time to vote for your favorite link up from The Pinspiration Project for October! Remember, the winner gets ad space on Lulu & Sweet Pea, My Three Bittles, & Fortune Favors. Today we won't be linking up...just voting! So take a break from creating and take a moment to vote for your favorite link up from TPP this month. These are a combination of the most clicked on link ups as well as Amber, Sarah, & my favorites from the month. All you have to do is click on the little star under the picture & name of your favorite one. The winner will be crowned as The Pinspiration Project Queen and will also win large ad space on all three of the hosts' blogs!